No other composite building material offers the physical strength, toughness and durability of Eovations™ material. It's the first composite you can confidently specify for structural applications, and you don't pay a weight penalty for that strength. Eovations material also offers outstanding physical toughness that gives it remarkable resistance to impact damage. 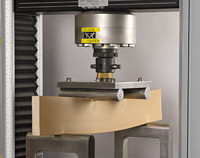 Eovations™ material has the strength required for heavy load-bearing applications. At the heart of Eovations material's exceptional strength is an oriented internal fiber structure that is a remarkable replication of wood's internal structure. The longitudinal fiber construction provides strength that is unprecedented in an extruded thermoplastic polymer structure. Its strength and stiffness approaches that of wood. This allows Eovations material to be used for structural applications that are impossible for other composite materials. For example, Eovations material offers more than enough physical strength for marine pilings. Eovations material does not exhibit brittle behavior. The oriented fiber structure of Eovations material provides unprecedented flexural strength. As shown in the photo, a peak load of 3,800 pounds on this on-edge 1" x 4" lineal of Eovations material did not result in catastrophic rupture failure. Pound-for-pound, Eovations material delivers unprecedented strength compared to virtually all other composite construction materials; that's readily evident in the modulus of elasticity graph above. The density range for Eovations material is controlled during manufacturing and ranges from 0.5g/cc up to 1.0 g/cc, much less dense than most composite materials used in building and construction applications. Eovations material is lighter to ship. It is far easier for workers to carry, reducing labor costs. And, its high strength and light weight prevent breakage when long boards are being carried manually. Based on its fibrous polymer structure, Eovations material is physically tougher than wood, and far superior to other composites. It resists impacts and compressive forces that easily destroy or damage other composites. In dart impact testing, Eovations material withstood a 580 in-lb impact force without significant damage. Eovations material maintains its appearance better than most uncapped wood-plastic composites under everyday abrasion and repeated low-level impacts. A variety of capping options for Eovations are under development. While many composites offer poor dimensional stability, Eovations material offers excellent resistance to warping, twisting and sagging. Its low lineal thermal expansion rate and extremely low moisture absorption help Eovations material maintain its dimensional stability over extended periods, even during harsh freeze/thaw cycling. Eovations material has a far lower rate of lineal thermal expansion than most other composite materials. In applications like siding and door or window frames, this dimensional stability can be a huge advantage in maintaining performance and appearance, and ensuring years of service. This low base of lineal thermal expansion and contraction facilitates the use of Eovations material in many assemblies and application designs. As the chart at right shows, Eovations material's thermal expansion rate is very close to aluminum and steel, making it an ideal choice in assemblies that also include these common engineering metals.